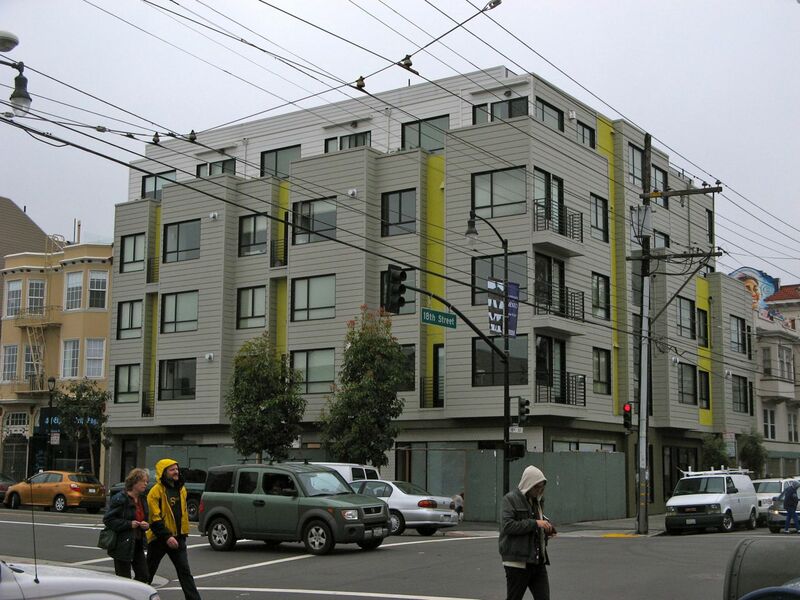 Back in 2010, a new apartment building went up at the corner of Valencia and 18th streets. The plan was for ground floor retail. Back then, Eater SF reported that the new restaurant would be a spinoff pizzeria of Farina Restaurant (only 1/2 a block away.) The name given then was Antica Pizzeria Napoletana. Farina's website says that the pizzeria will open in 2011. That was back in February 2010. During the intervening 2 years, the wooden walls around the building saw more advertising posters. 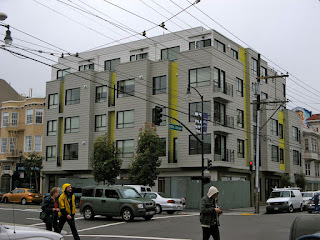 The only folks eating high class pizza were those who got take out at Delfina Pizzeria a block away. Finally, 2 years and 1 month later, it looks like the restaurant is actually taking shape. Wall tiling is being applied this week. More importantly, and in a strange transportation connection, the wall tiling being applied is identical to the BART station hex-globe tiling at Montgomery and Powell street stations. Yes, that strange 1970s futuristic bubble tiling you see everywhere in those two stations. Word is that it will also be on the 18th Street facing wall and inside the restaurant. Will that be tile bubble heaven or hell. We'll have to wait and see. No news on the name of the restaurant, but considering all that labor and cost to put in BART style tiling, I don't think it will be a $1 a slice kind of pizzeria. View of tilled outside wall with bar inside of pizzeria. Application of tile on new pizzeria on Valencia Street at 18th Street. This is the same tiling that a university or university extension used in a poster ad campaign, often featured in BART trains and stations. I think it was Golden Gate University, but I didn't find anything on it after a quick web search. 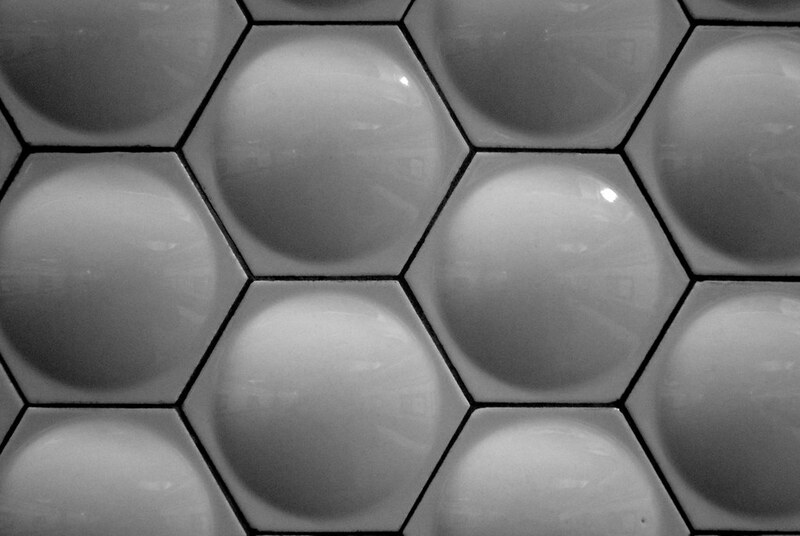 Note that the tiles in the two SF BART stations are ALL "domed" hexagons. In contrast, the tiles at the restaurant are a combination of domed and flat hexagonal tiles. Four out of the six tiles on the wall are domed, so I'd say that's pretty close to duplicating the effect of the BART walls. Page 9 & 10 (12 & 13 of the PDF)- has the domed and flat hex tiles in the Atomic Collection. These are the tile models, you'll need a mix of domed and flat tiles to handle the edges and corners.